The star crypto trader on global investment platform eToro isn’t downhearted now that he is no longer a crypto millionaire. Instead, Jay Smith is feeling the rejuvenating warmth of the crypto spring as it thaws out the trading scene. Far from being downcast, he holds to the firm conviction that crypto is a long-term game; for him cryptoassets are a bet on what humanity’s future will look like. 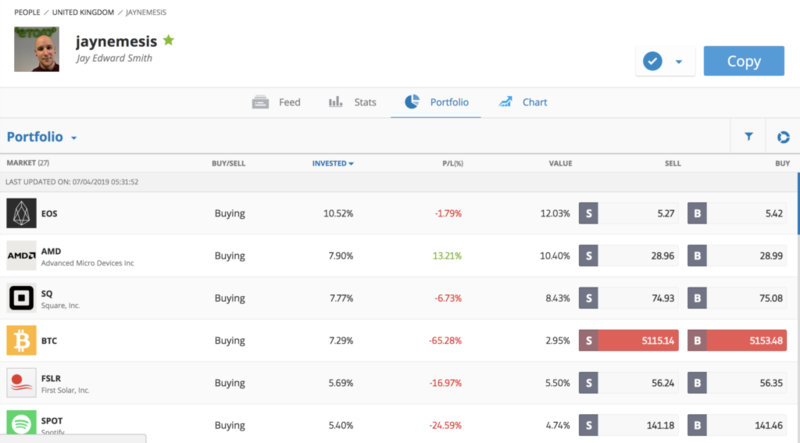 Smith, known by the handle jaynemesis on eToro, has 4,139 copiers on the pioneering social trading platform that enables customers to automatically copy the trades of fellow platform users. Aggregating the funds his copiers have allocated to his trades means his assets under management amounts to more than £5 million ($6.5 million). 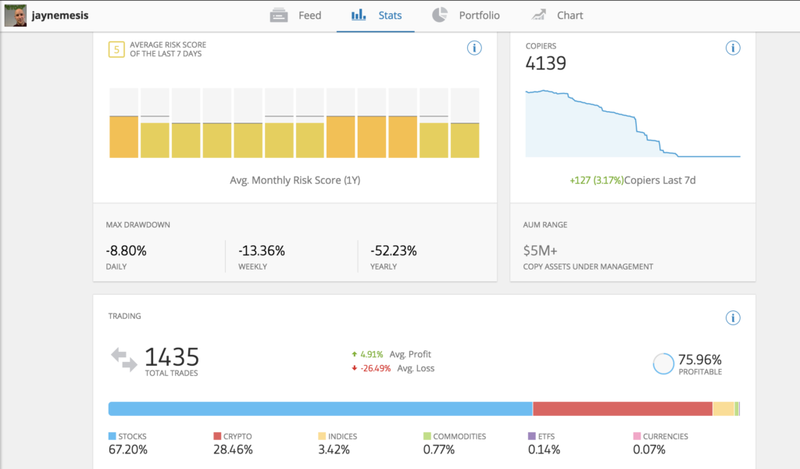 eToro rolled out its social trading platform in the US last month. 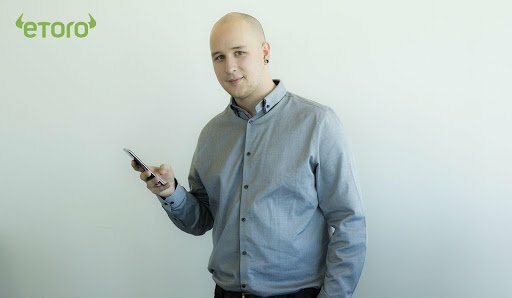 I interviewed Smith a few years ago on email after noticing he was the most successful crypto trader on eToro. That was before he became one of the best known crypto traders in the UK. This week he featured on BBC World Service’s Business Daily programme. The World Service is perhaps Brexit Britain’s last lonely vestige of soft power on the global stage; still a popular station with influencers in the English-speaking world and beyond. In the critics’ corner was David Gerard, author of Attack of the 50 Foot Blockchain. We won’t dwell long on his comments because they don’t add much to the sum of human knowledge in their repetition of the well-worn “no use case” line and the bubble thesis. He elaborates further with the “greater fool” premise. How many times he expects the bitcoin bubble to burst Gerard does not tell us. From the New York Times to The Economist and Motley Fool, we’ve had much the same from the rest of the mainstream media and assorted “expert” critics. Far more interesting were the comments from Smith in which he highlights the new-found resilience of the market built up through previous bear markets. He also points to a future tokenised world in which he sees stockmarkets disrupted by the decentralisation of crypto and the key barrier to adoption being a solution to the problem of delivering ease of use. So how much was Smith worth at the height of the bear market? Smith explained how he made his first bitcoin investment in 2012, when it was trading at £25 ($32), buying 0.1 bitcoin to begin with. So how did he get through the Mt.Gox implosion of 2013, when it dropped 90% in an hour? And, as this is crypto, it all unfolded in the open on reddit and the bitcointalk forum. And if we need a reminder of the dynamic that is perhaps beginning to unfold now, he described how the last bull market took hold, and the inexperienced, less knowledgeable buyers it attracted. The pain for swathes of retail investors was very real, although the extent to which people invested what they couldn’t afford to lose may have been overstated. “And so those people are left in a position where they’re potentially too scared to sell or if they’ve invested more than they can afford to lose or worse it they have used leverage, credit debt or remortgaged their house, which I know a lot of people have done from reading those threads, they’re left in a position where they are pretty desperate,” says Smith. Smith is now a full-on professional investor. “I describe it as my life at the moment,” he told the BBC. Smith is currently 67.2% invested in stocks and only 28.4% in crypto, which feels overweight stocks and underweight crypto if the turn in sentiment continues to push crypto higher. His top crypto holdings are EOS (10%), BTC (7.2%) and Dash (5.1%). So, what about the mindset of crypto investors? Would you describe yourself as a libertarian, asks Saragosa? His reply might surprise some. For Smith, crypto is about much more than just payments. His example of how it could make avoiding tax harder might not go down very well with John McAfee and many others in the crypto community. “So anyone who wants to do that can copy and paste the code and start their own cryptocurrency that is focused on what they want to do. And that’s what people have been doing. Where are we now in terms of value and adoption? Smith homes in on the poor usability and lack of understanding among the wider population. He’s looking 10 years ahead before serious traction happens for bitcoin, although as he points out, he’s said that before. “I’m probably speaking another language to most of your listeners at the moment. It’s not an easy thing to use, so I think realistically it’s got a very, very long time before we start to see real mass adoption. You know, 10 years or something I was one of the people 10 years ago that was saying that it would be in 10 years’ time. So how to fix this? The key to speeding adoption is building user-friendly tools, says Smith. And then there’s regulation in the sense of tax regimes. He provides the example of how the UK tax authorities treat buying goods and services with bitcoin as a taxable event. But if ordinary people can’t get their head around it being just code, how does adoption move forward, does crypto really have a future, the BBC presenter presses? “If you look at how different generations have invested, the baby boomers – stocks was their thing, before that government bonds was the big thing. “I think if you look at millennials they are looking more and more to things like cryptocurrencies. Although he wisely avoids the word “tokenisation” presumably for fear of obfuscating matters for his audience with jargon, he nevertheless explains how it would work with equities – and beyond – in a clear and accessible way. “I see a future where stockmarkets get replaced by cryptocurrencies because it is more efficient. If I can transfer you my shares in Facebook right now without having to go through any exchange, or anything like that – just from my phone to your phone instantly for free – that’s a pretty compelling argument to move toward cryptocurrencies. Smith sees strength growing out of the trials and tribulations in the wild swings of crypto markets. The market is maturing as resilience grows. Smith thinks people will have to learn through their own mistakes. Listen to the full show here (registration required).